Skills decay in laparoscopic surgery has been demonstrated for students and residents using simulation devices. To determine the effect of a long period without practice of expert attending laparoscopic surgeons who had previously practiced extensively and achieved stable performance, we retested these same surgeons 30 months later. Four expert laparoscopic surgeons (>100 advanced cases) performed 4 iterations of 3 basic laparoscopic tasks of increasing complexity and difficulty (Retract-Dissect = easy; Traverse Tube = intermediate; Dissect Gallbladder = hard), on a virtual-reality simulator (SEP, SimSurgery AS, Oslo, Norway) 30 months after extensive prior practice (minimum 14 iterations) to stable performance levels. Simulator measures included task time (seconds), instrument tip trajectory (cm), and number of errors. Decay of skills was detected by comparison (paired t-Test) of a sample of the final 4 iterations (stable and flat segment) of the past learning curve versus the average of iterations 1-2 and 3-4 (expected rapid improvement segment) of the present learning curve. Decay of performance was observed for current iterations 1-2 for (a) 2 of 3 simulator measures for Dissect Gallbladder task (time 85 ± 10 vs 121 ± 10 seconds, p = 0.002; errors 8.5 ± 3 vs 4.8 ± 1.2 cm, p = 0.032) and (b) 1 of 3 simulator measures for the Traverse Tube task (time 92 ± 21 vs 100 ± 21 seconds, p = 0.005). These performance decrements persisted for current iterations 3-4. However, no significant decay of performance was observed for the easier Retract-Dissect task. Initial performance (iterations 1-2) was significantly better for current versus past Traverse Tube use (time 100 ± 21 vs 118 ± 20 seconds, p = 0.02; pathlength 250 ± 44 vs 329 ± 38 cm, p = 0.01). Extent of decrement in performance over the lengthy interval without practice was dependent on level of difficulty of the task examined. 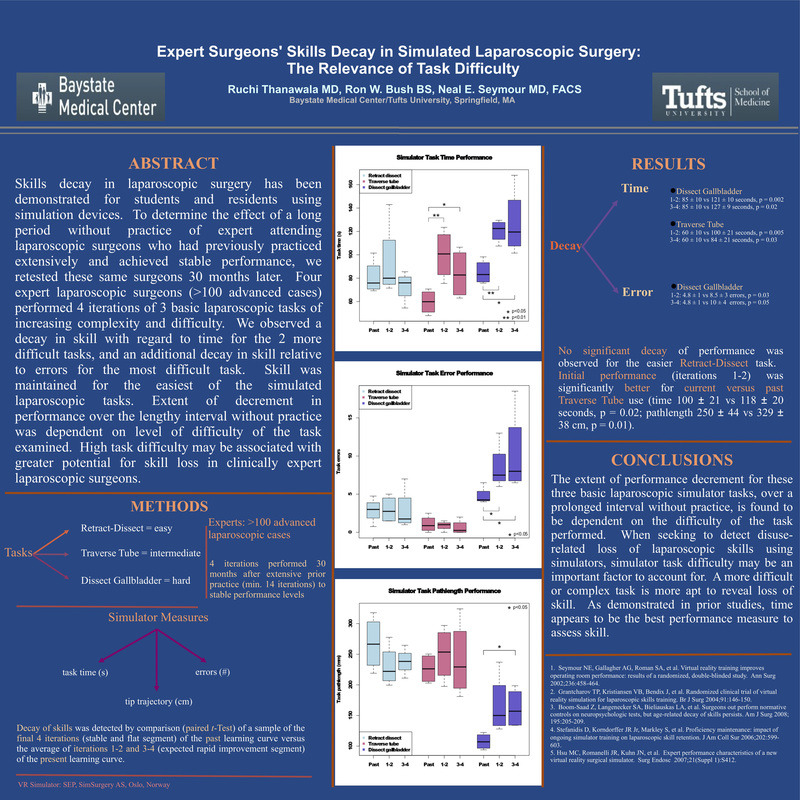 High task difficulty may be associated with greater potential for skill loss in clinically expert laparoscopic surgeons. Based on skill level measured at the past and current learning curve onset, some retention of remotely acquired skill was evident for the intermediate difficulty task. Time appeared to be the best performance measure to detect loss of skill. Determination of rate of acquisition of prior levels of proficiency will require completed learning curves.